The kernel-based Virtual Machine (KVM) is a virtualization infrastructure many have become familiar with throughout the industry. This article will guide you through getting a basic KVM hypervisor up and running and ready for use. In order to fully utilize the KVM, you will need a CPU that has virtualization extensions, and these will need to be enabled in the BIOS of the machine you’re working on. In general, you’ll need to look to enable VT-X or AMD-V depending on your system architecture. If you receive no output then it’s likely that virtualization extensions are not enabled in your BIOS and you will need to take steps to rectify this before moving forward with the KVM installation. For the purposes of this article, the assumption is that this RHEL machine running KVM will be used as a standalone hypervisor, so we will not be installing any graphical tools to manage the Virtual Machines. Excellent! We’re almost ready to begin creating Virtual Machines! By default, KVM will set up a network interface on your hypervisor named ‘virbr0’. It creates a network for your Virtual Machines which uses NAT (Network Address Translation) to access resources outside of the network it resides on, which in our case is 192.168.122.0/24. Depending on your environment, you may wish to create a bridge interface on your KVM hypervisor to allow the Virtual Machines to use the same network as the hypervisor by default and remove the layer of NAT. When you fire up a new Virtual Machine with the ‘—vnc’ option, you’ll find that it creates a listener on the localhost (127.0.0.1) address. If you want to be able to access this remotely without using things like SSH tunnels, then you’ll need to amend the ‘/etc/libvirt/qemu.conf’ file by removing the # in front of ‘vnc_listen = “0.0.0.0”’. This will allow any new VNC connections to listen on all interfaces and allow you to connect remotely. Once we have our ISO, we’re ready to do the fun bit and get a Virtual Machine up and running on our hypervisor! Whilst there are many options available when provisioning a new Virtual Machine, I’m going to include a simple one-liner below which will get you up and running. The above means that it’s waiting for you to proceed with the setup. We need to find out what VNC port the Virtual Machine Console is bound to. In order to do this run virsh vncdisplay fedora23. If this is the first Virtual Machine you’ve provisioned, then it’s likely it will return with “:0”. This means it’s listening on port 5900. If it was “:1” then the port would be 5901. 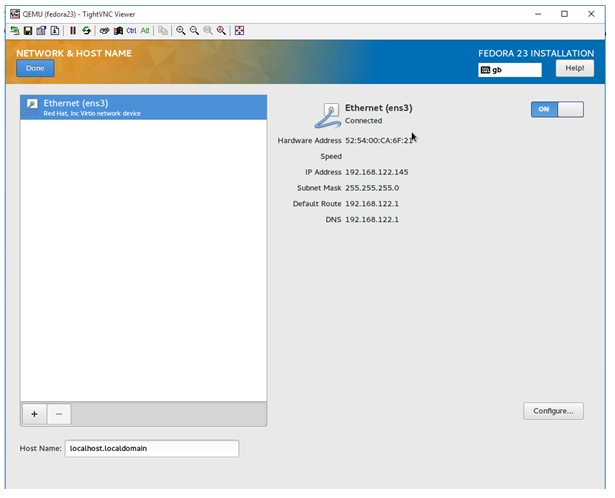 Now that we have the port of the VNC Console, use your favourite VNC client to connect to the address of the hypervisor and port. In my case, this would be 192.168.10.109:5900. As you can see from the above screenshot, the VNC viewer shows the console of our Virtual Machine, and we can also see that an IP from the network range we discussed earlier has been assigned successfully! KVM is an incredibly powerful hypervisor and is used as the backbone of many virtualisation solutions out there (Openstack, for instance). We’ve only touched the surface of what KVM is capable of, but you now have the building blocks for getting your own virtualisation solution in place. Keith Rogers is an IT professional with over 10 years’ experience who currently works for a large broadcasting company out of the UK. His long-standing passion in computing has led to him taking up multiple extra-curricular activities to further his knowledge and fuel his interest. Keith has spent years working with Linux by utilizing Apache, MySQL and PHP to build full web stacks along with creating more complex load balanced and redundant solutions suitable for high availability. In the last 2 to 3 years he has found himself using new cloud- based infrastructures such as those provided by AWS and Azure to assist in achieving these goals. Currently, he’s working in the DevOps space with a focus on utilizing new automation tools such as Terraform / Ansible / Cloud-Init to efficiently and consistently deploy infrastructure. Along with this, he has been focusing on improving the bridge between Operations and Development by deploying new tools like Graylog to make it easier to parse log data and visualize any patterns within these logs. In his spare time, he likes to spend time furthering his tech knowledge by utilizing new technologies at home.